/Crumbling Driveways: Patch, Repair, or Replace? Clearly, it’s a good idea to invest in some repairs. But how extensive do they need to be? And how expensive? Here is a quick guide to determining the types of repair that your driveway needs so that you can get your place looking its best. While concrete seems incredibly solid, the ground underneath it is not. Shifting moisture levels, cycles of freezing and thawing, and even occasional seismic activity can cause the earth underneath to shift or swell. And of course, there are the thousands of pounds of metal that drive across it multiple times a day. These factors are inevitable, and concrete forms cracks as a result. A good company will do as much as they can to mitigate this while installing your driveway, preparing the earth before pouring concrete, and creating seams that encourage cracks to form where they’ll be less of a problem. But just as upholstery eventually wears down and siding needs to be replaced, even the best driveway will someday form cracks in the main body of the concrete. If the crack is less than ¼ of an inch wide, you’re in luck! This is easy to repair with the type of crack filler you can find at your local hardware or home improvement store. If it’s very deep, you can backfill the cracks in the concrete with sand beforehand. This type of fix is inexpensive and easy to do, even for the most inexperienced DIYers. For cracks that are wider than ¼ of an inch, there are other materials that can be used as fill. This type is typically thicker and more expensive than liquid filler, and is a bit more of a pain to use. It will fill a larger crack, but it’s important to keep in mind that wider cracks are a sign that more damage is on the way. This is a temporary fix for the sake of immediate appearances. Holes require more effort and expertise. Before you can patch a hole, any debris and loose concrete needs to be cleared away, which often leaves the hole larger than it was to begin with. Then the patching material needs to fill the hole in the concrete and be tamped down thoroughly, leaving the top level with the driveway itself. There is a wide range in the quality of patching material—and in price. In general, you get what you pay for. A hole patched with a top-notch fill can potentially last years longer than a more cheaply-filled hole. This, of course, assumes that it’s been filled and tamped correctly. No expensive materials can compensate for poorly-executed work. While certainly less disruptive than getting a brand-new driveway, patching does have some downsides. For one, patches tend to be obvious, leaving your driveway with a spotted appearance. And secondly, they only buy you a few years, delaying the inevitable. If your driveway is developing larger holes, it will eventually need to be replaced. Patches can be invaluable if you need some time to save up for a new driveway, but if you are able to do a full replacement earlier, this is often the better choice. Driveways are not eternal fixtures, and anyone who owns a home or commercial building for a longer period of time will eventually find themselves in the position of needing to replace theirs. Clearly, this is not a job that is accessible even to more adventurous amateurs. As mentioned earlier, a new driveway’s lifespan is greatly affected by the quality of the work done to install it. Choosing an experienced and ethical company to do the work is critical if you want your driveway to last. 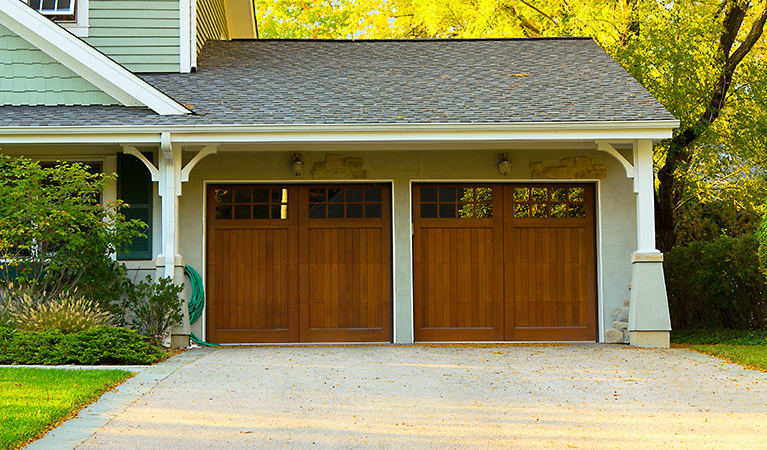 While replacing your driveway can seem like a stressful prospect, it’s not all doom and gloom. This also gives you numerous options to alter or upgrade the appearance of your driveway. If you’ve repainted, rebranded, or changed the style of your landscaping, this is an opportunity to create a coherent look, giving your home or business an instant boost to its curb appeal. Find an informed Concrete Contractor to answer your questions. Are you thinking about replacing your crumbling driveway? Get a free estimate with R&M Concrete. We’ll help you make an informed decision so you’ll be satisfied with your concrete project. Best Tips for Cleaning Concrete Floors →← Could concrete floors really be the best solution for my new home or business?